Organized as a body of believers on July 4, 1797, the original members included Colonel Ebenezer Crafts, for whom the town was soon renamed from its original charter as "Minden"; his wife , Mehitabel; its first pastor, Samuel Collins; and a score of others who have moved her from Sturbridge, Massachusetts. "The Wilderness and the solitary places shall be glad for them, and the desert shall blossom as the rose." In March 1802, it was voted to build "a house twenty by thirty feet with ten-foot posts..." for public gatherings. The building was shared by Congregationalists, Methodists, Covenanters, Baptists, and Universalists, but this arrangement was to prove unsatisfactory. By 1818, the five faiths had gone their seperate ways. Following a vote by the Congregational Society, the present building was completed and dedicated in 1820. Originally, two rows of small windows and a gallery were along the north and south walls. Worshippers sat in box pews facing a single row of eight windows, an entrance door, and an elevated pulpit reached by stairs on the west wall. In 1829, Craftsbury Academy was founded, and community life revolved around both church and school. The Academy headmaster was often the pastor. In 1849 Rev. Samuel Read Hall was recruited to "... settle over the church and at the same time to take charge of our Academy." The Church agreed to a salary of $400 and housing. The Rev. Hall, with a career as an educator, innovator, and textbook author behind him, came to Craftsbury and stayed fourteen years. He preached twice a week, shepherding his flock while enlightening inquiring minds in the classroom. Soon, Craftsbury village was a thriving commercial center. In 1854, the Methodist Society moved from the southwest corner of the common to a larger building in the village. In 1848, and again in 1897, the Congregational Meetinghouse was remodeled. Galleries were removed, the building widened, windows changed, the pulpit lowered and the ceiling given a graceful arch. In 1925, the Methodist church was destroyed by fire. Pews, chairs, pulpit, carpet, furniture,and memorial windows were saved. Less than a year later, the new Wilbur Fisk memorial church building was dedicated. Meanwhile, Methodism reached into Collinsville, the hamlet on the western side of town. In 1920, land and a building were deeded for a church. The parishioners renovated the building. Services, Sunday School, prayer meetings and socials were held through 1940. The dwindling population, as people moved away from the hill farms, led that church to close. Diminishing human and material resources in the early 1940's led to discussion between the Congregational and Methodist churches. In 1961, a governing committee of both churches was formed. In 1963, further discussion and negotiation culminated in the adoption of the Constitution of the United Church of Craftsbury. The Congregational Church underwent renovation once again, and on January 20, 1967, members and friends gathered to dedicate the transformed building. In the sanctuary today hangs a gleaming, modern sculptured cross with matching altar candlesticks. 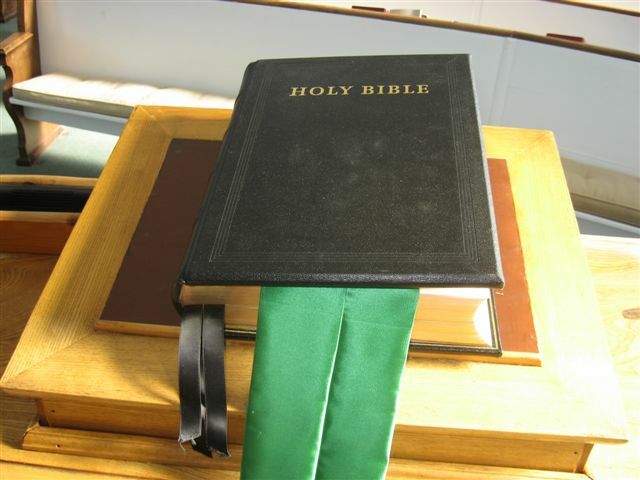 The Bible from the Collinsville church rests on the ash pulpit saved from the Methodist church fire of 1925. The silver communion service, in use today, was given to the Congregational Society by Colonel Crafts. Steadfast as the Green Mountains on the western horizon, serene as the heavens to which its steeple reaches, the "Church on the Common" extends its welcome to those who enter, its solace to those who seek comfort, and its inspiration to those who go forth into the world.